3 Best FM Transmitter Apps: FM Transmitter apps are becoming a trend in the market and believe me these apps work well for long drive. While we are out for a long drive or a journey we all love to hear music and believe me most of carry Android Smartphone too which can have loads of music stored. Sometimes you might not find any of the FM radio playing any good song, and then what you can do is simply tune your car to your phone frequency using FM transmitter app. Obviously we all find it good to listen to music and entertain ourselves with hit music, audio and this helps us relax a bit on journeys as well. So big question is that why do we really need FM Transmitter apps in general? When we already have radio FM and portable media for car to play. The real reason is not more than just a delight to listen to songs which are not being played on any radio. Even at times we might not have songs we like or our favorite playlist on any portable media or disk to choose from. Simple we might be having some good songs and music on our phones, which we can convert to car audio frequency by making use of FM Transmitter app. 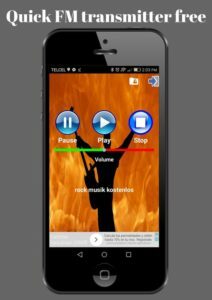 What is an FM Transmitter App For Android? So we all have Radio FM apps on our Android Smartphone, which we use to tune to different radio stations. While you are on a long journey, FM Transmitter app can come in handy because it can transmit the Radio song from your phone to your car directly. FM Transmitter stands for Frequency Modulated transmitter app which will easily play songs or tunes from your phone to your car stereo. In simple words you can play any song or music from your portable device to car stereo deck easily. All you have to do is download a good FM Transmitter app for your android device and everything will work out just fine. 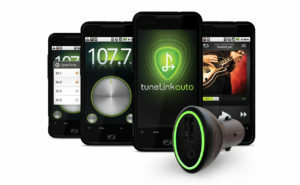 TuneLink Auto is number one on our list and this has been a fine choice of hundreds of Androids users to transmit FM to car studio. It is based on universal wireless Bluetooth tech that can easily convert your phone frequency to car studio audio frequency in no time. This app has a pleasant UI design, pretty easy to navigate and visible icons that helps you to plug to play music in no time. When the app starts working, it will glow green which indicates that power is being transmitted. This app comes with a fast FM transmitting solution that gives you an awesome music without any distortion. Second on our list is Quick FM Transmitter app for Android, which might be mingled with a Chinese language yet is one hell of a FM app. We can select the different frequency range from the list and connects with an FM for IS03, and it can also work for IS01, IS03 and IS05. It might not be a perfect option for fans who like swift working apps, because this one takes a bit of time to learn and start. This app is available for free of cost on Google Play Store and can be downloaded from here. Smart Connect by Sony might not have been so much of a popular app, but believe me it works well on Android phones and smart phones. You can now easily stream music and audio right off you’re Smartphone to your Car stereo with such little efforts. Well this app is not just an FM transmitting one, but can also be used for turning your Wi-Fi or GPS system off. So, we get a FM app along with a Wi-Fi or GPS switching feature that is an additional point. 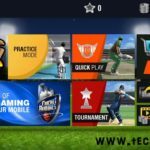 Here is the link of this app on Google Play Store if you are wondering how to install it. Note: We might give you the very basic and in depth review of every app we have listed, but in the future we will surely update our content with more information. So we have now learned more about how useful and amazing FM Transmitter apps are to listen, music and songs easily. And obviously you will find our list of 3 best FM Transmitter app for Android 2017 this year.